W Retreat has one of the best house reef. A pity that we don't have our underwater camera with us. 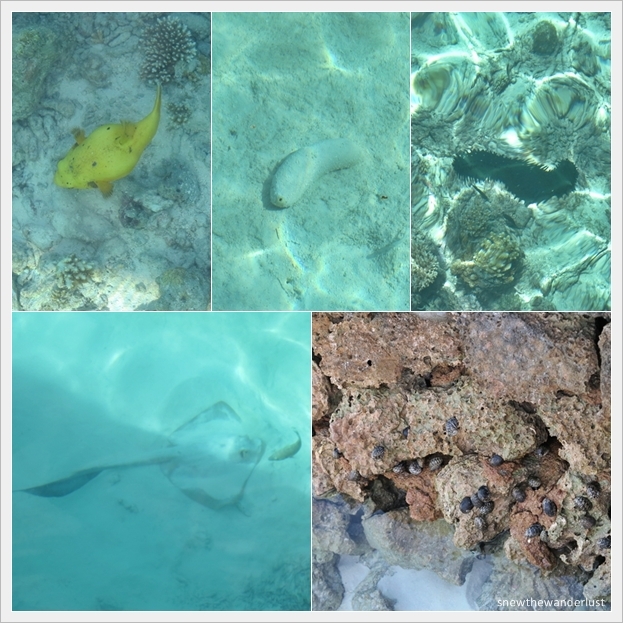 But despite that, I was able to get some photos of the abundant marine life. Can you spot how many crabs are there? There are three of them. Look carefully. Pals, can you all identify what the marine animals are? 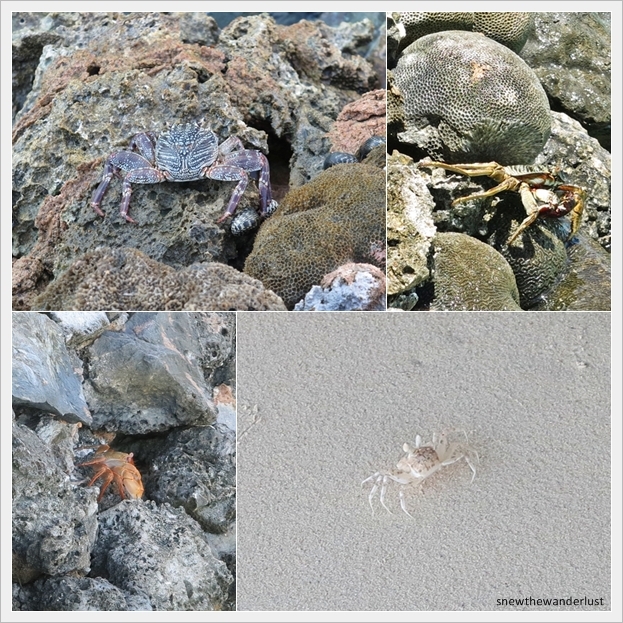 Spot the different kinds of crabs? Look carefully at the photo below. Did you see the big pool of fishes? We see the huge school of fishes everyday, at the link bridge between the Ocean villas and the resort island. Actually it's quite scary if you are swimming or snorkelling in the beach area isn't it? The marine biologist at the dive centre told us it's what they call Scad. I'm not sure if we get it correctly. Do leave me a comment if you know what these fishes are. The resident crane where we see everyday at the beach area. Look at the moon, arising from the horizon as the sun is setting. With the passing clouds, the sun seems hiding behind the horizon. I love the silhouette of the ocean villas against the sunset. Saw this outside one of the beach villas. It took me sometime to recognise that it's W that they are drawing. But isn't it wonderfully done? I guess it's supposed to mark 5 May at W Retreat Maldives. Well, you can imagine how sad I am on our day of departure. The Hotel Manager - Laurens, together with his team, is once again present to send the guests off. This is the heart-warming wave from the window of our seaplane. How can we not return to the resort again? This is my best holiday so far. The End. I'm am really sad. Just to add, beautiful shots btw and great info on the W... my wife and i are going there in July... 4 more weeks! can't wait! We stayed at Constance in 2010 and had a wonderful time... and by looking at the W from the photos, looks very similar.